Founded since 2004 under a practice named ARCHINITY in Ho Chi Minh city. (*) : Along with design consultancy, our construction and production service has been established in the format of “ Design – and – build “ for Finishes work, Interior fitting out and furniture. This strategically creates a sequence from design to hand- over stage in favor of minimize all unnecessary details in the architecture compartment and decoration afterward as well. 1/ The Header : INFINITIVE’ way of consulting goes side by side with client’s requirement to deliver Budget meet, Simple, Adaptive and Last looking works. 2/ The Role :INFINITIVE’ role is defined as an objective guide in the initial concept from what clients from what clients have in mind and basic requirement and develop into idea, as well as materialize the picture by mean of Technical interference, Know_ how advises. The final product will not be a perfect one without mutual understanding and comprehension between the objective party (Architect) and the subjective party (Clients). 3/ The Stance: Every single and tiniest thing can tell art. But reaching the “ State of the Art” requires sophistication, uncompromised stance and comprehensibility. We start trying to be comprehended by the first reader of the works: clients. One geometries grows bricks, stone, motar which alone have a been the best jewlry to enhance your space other than any extra decoration, you could have earned a state of mastering your space, with a little help from your friend, architect. 2. Chin Kam – Oversea Architecture Pantner - B.Sc. Architecture- Sydney - CK&A - Since it’s inception,CK&A consultancy international Pte. Has completed projects in a variety of countries including Singapore ,Vietnam ( Hanoi, HCM) China ( Shanghai. Guangzhou, Indonesia ( Jakarta) , India (Mumbai, Pune ,Chennai)& Srilanka ( Colombo) - CK&A has been a oversea partner with INFINITIVE since 2008. 4. Đồng Minh Qúy - B.Arch.Design manager – Architect. 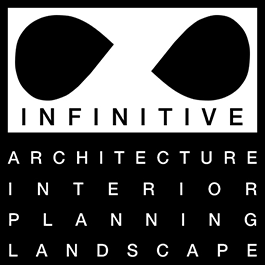 The Header : INFINITIVE’ way of consulting goes side by side with client’s requirement to deliver Budget meet, Simple, Adaptive and Last looking works. The Role :INFINITIVE’ role is defined as an objective guide in the initial concept from what clients from what clients have in mind and basic requirement and develop into idea, as well as materialize the picture by mean of Technical interference, Know_ how advises. The final product will not be a perfect one without mutual understanding and comprehension between the objective party (Architect) and the subjective party (Clients). The Stance: Every single and tiniest thing can tell art. But reaching the “ State of the Art” requires sophistication, uncompromised stance and comprehensibility. We start trying to be comprehended by the first reader of the works: clients.